Children orphaned through war and disaster are waiting for new forever families. Help provide loving parents and permanent homes for these desperate children. She grew up as a happy child in Portsmouth, Virginia with two older brothers and an older sister. Life was good in her grandmother's home, full of love and support. But then her grandmother passed away and Julia's world fell apart. She and her siblings were forced to move to North Carolina to live with their mother, who abused them so severely that they were placed in foster care. Over the next ten years, Julia endured 16 placements, 9 school changes, and 7 social workers. She was so used to being passed around, that when Lorraine invited her into her home, Julia had nearly given up. But Lorraine didn't want to be a temporary part of Julia's life. She told her she was in this for a lifetime. What Julia thought would never happen, finally came true. She was adopted at the age of 23. Tragically, Julia's story is not uncommon. 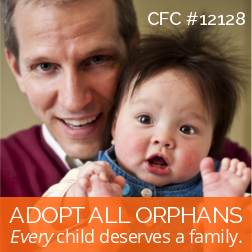 There are over 100,000 children in foster care waiting to be adopted. The National Council For Adoption is a 34 year-old organization whose mission is to promote the well-being of children, birth parents, and adoptive families by advocating for the positive option of adoption. We advocate for children in foster care, like Julia, promote infant adoption as a positive option, and help millions of orphans around the world through intercountry adoption. Help us make life better for these desperate children.